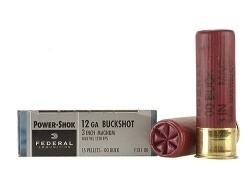 Featuring Federal's Triple Plus wad technology, Power-Shok buckshot is proven to give you better shot alignment and hard-hitting performance in the field. Combined with Federal's reputation for quality and awesome stopping power, you'll get the results you've been looking for in a buckshot round. Recommended for use with medium sized game like deer and antelope.